vacancies may attend Walk in Skill Test with duly filled application form. other details are given below. Click here to see the official notice of NCERT Recruitment. 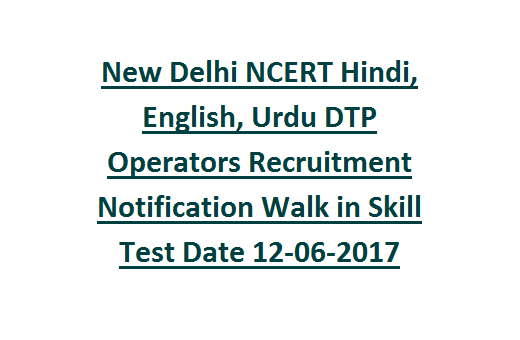 NCERT Walk in Skill Test date: 12-June-2017 at 9.30 AM. Sri Aurobindo Marg, New Delhi- 110016. Photoshop, In design & Equation Editor. Also proficiency in English/ Hindi/ Urdu Typing. For SC/ ST/ Woman candidates is 35 years. For OBC candidates is 33 years and for PWD candidates is 40 years. Recruitment may attend walk in skill test conducted on 12-June-2017. by Planning and Monitoring Division. time of Skill test. Walk in Skill Test will be held on 12/June/2017 at 9.30 AM.